Aside from the monthly Sunday Spiritual Service, Hope Interfaith Center provides several services and resources to our spiritual community either by arrangement, or on an on-going basis during open business hours. The services we provide are listed below. If you’re looking for specific scheduled events, checkout our Calendar or Events page. "Pure Hope" is a monthly audio podcast show on Blog Talk Radio . Join Rev. Janice "Hope" Gorman and her many inspiring guests as they bring new and out-of–the-box spiritual insights designed to help each of us enhance our journey and well-being. 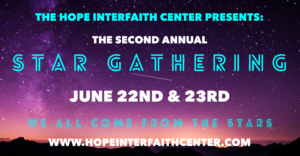 Reverend Janice "Hope" Gorman, the leader of the Hope Interfaith Center, offers personal spiritual counseling sessions for individuals and couples. People have been coming to awaken into their own truths and to walk through a radical new gateway to personal and global transformation. Coming to sessions with Hope can precipitate a shift towards a completely different state of consciousness. The purpose of a spiritual teacher is not to transmit knowledge but to facilitate the client in becoming aware of his/her pre-existing nature. A session with Janice Hope can help bring to surface the client’s dormant qualities.